It seems the Cork hurling dispute is rolling to an ignominious conclusion tonight. Word has it that Gerald McCarthy, the Cork hurling coach with whom last year’s hurling panel are at loggerheads, is to announce his resignation at the County Board meeting tonight in Mallow. His resignation will probably result in the 2008 squad calling off their strike and making themselves available to train for the new coach, whomever that may be, and bringing yet another ignominious chapter in Cork GAA to a bitter and divisive end. I can’t say I’m too shocked a the news – when any sporting team encounters success, it’s inevitably the players who win the matches that will garner the bulk of the public’s support, while the perceivably intangible effect that backroom teams can have means that they’ll only be a certain few who can appreciate their input. Thus when the county team wins two All-Irelands in 2004 and 2005, and makes the last four in each Championship since, it would inevitably be the playing squad that the public would come to support. It’s already manifested itself in the football code; in 2007 Billy Morgan brought the footballers to their first All-Ireland final since 1999, but when the players started to become irked with his style, the public were firmly on one side. This time around, over thirty thousand redshirts showed up to a public demo in favour of the beleagured players. One might ask the question of how one is meant to display support to a status quo – are we to expect a series of “We like things as they are!” rallies? – but that’s for another post some other time. It’s difficult not to feel that Gerald McCarthy has been very hardly done by, in being coaxed into this difficult decision. The man was reappointed at the correct levels only last winter, by a committee that included representatives of the players who then immediately sought to overthrow him. Certain people – no need to name them, it’s fairly obvious who they are – decided retrospectively they’d rather have their own man in the job, and proceed to mount a public offensive making sure they got their way. The distinctly Corkonian machiovellian way of doing things doesn’t fix anything. The flagrant disregard for due process is, largely, the problem with what Ireland has become of late; we don’t do things the right way, decisions are made with their consequences as an afterthought, and not – as they should be – with their consequences as the driving factor. Gerald McCarthy has done nothing wrong here. He was approached asking if he’d like to be considered for the job again, he assented, had his name put to the committee, who assented to his return. The committee featured players’ reps, who had been put there as a resolution to the striking footballers that had gone the year before him. But alas, McCarthy seems to have decided his own sanity should take preference over his public perception, and very understandably so. What should not be overlooked in this matter, though, is that McCarthy is far from the only wronged party here. Since the 2008 lot decided to up sticks – literally – there has been another panel of three dozen, plugging away with the weight of public opinion against them and with the disapproving gaze of “senior” (read “striking”) players furrowed from above. Now that the individuals who make up this non-existant entity, the “2008 playing panel”, seem to be wanting to return to the fold, will presume they can walk back into the team. Thus a smatter of young men who have represented their county when so few wanted them to do so, will be shoved into the background, probably never to see the inside of a red jersey again. As for the rest of the players – who’s to say that they won’t disagree with the next manager either? The descent from “Gerald McCarthy is the second best manager we could have” (Ger Cunningham being the reputed first choice) to “prepared to work with anybody who isn’t Gerald McCarthy” has been clinical and spinelessly swift, a quick hop from wanting the best for their county to wanting the worst for their beleagured boss. Will the Cork players get to choose their next boss? If it isn’t Ger Cunningham, will they throw another hissy fit? Cork 2009 is inevitably a lose-lose situation. By deciding to boycott the current managerial structure, last year’s players took the enormous risk of bringing their illustrious playing careers to premature endings. By finally having him overthrown – even if not totally on their terms – the Cork players have put themselves under enormous pressure themselves. Failure to win the All-Ireland (and it’s difficult to see how they can, with the best players having forgone the low-key but vital league matches against the top opposition, while Kilkenny continue obliterating all who cross them) can only result in public backlash against the spoilt returning players. How would the public and players react if, having failed to win the 2009 All-Ireland Championship, the individuals who could assume the title of “the Cork hurling coaches” decided whimsically and en masse to refuse to work with the current panel? There’s something to stew on, now that this gruesome and macabre tale has come to its bloody and terrible conclusion. The King is dead; long live the Continuity King. Edit, 9.48pm: Within the past hour McCarthy has confirmed his resignation; RTE Sport carry the bulk of his statement on the website. It ain’t pretty. 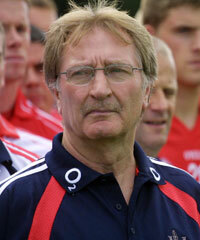 I have decided to step down as manager of the Cork Senior Hurling Team, effective immediately. I am not, as some would have it, resigning ‘for the good of Cork hurling’. In fact, and without being presumptuous, I would regard my resignation in the current circumstances as being detrimental to Cork hurling in the long term. I am quite confident that after two overwhelming endorsements, a third vote would not have removed me at County Board level. However, only my resignation, apparently, will allow the best group of Cork hurlers to take the field. While the latter objective is very desirable, that outcome should not be confused with the future health of Cork hurling or its direction in the coming years. A few days ago, my father who is in his mid-eighties, pleaded with me to step down after one of my sons, in my absence abroad, received the latest threat against me. The threat against my life, which has been referred to the Gardai, is the latest in a sequence of threats and abuse, random or organised I do not know, which I and my family members have had to endure over the past few months. Given the kind of vitriol at recent public meetings and indeed in some media commentary, it is hardly surprising that thugs have attached themselves to the ’cause’ of the 2008 hurlers. I cannot continue to expect a family even as supportive as mine to withstand that pressure and possibly to put their own safety at risk. This latest threat is one of two tipping points that have occurred in recent weeks. It’s been a long and difficult four months. With any willingness on the part of the players, the dispute could have been resolved almost as soon as it began. The Mulvey arbitration provided for certain steps to be followed in the event of any dispute arising. These precluded a strike by the players and allowed for discussions, mediation and arbitration to take place. The players went on strike, refused to meet the Board or the management team together and refused to engage in mediation. There is huge irony in the thought that the clubs who are now supporting the players were among those who voted for mediation at the County Convention last December – which the players refused to engage in. They are now supporting those players who rejected their specific direction. I am well aware that players will always garner popular and media support when positioned against a management team or the County Board. However, I am surprised that the media, with a few honourable exceptions, never challenged the players’ views. I am also surprised that journalists who never met me or spoke to me could write so authoritatively about my position and my motivation. The criticism of the County Board has been well over the top. For any faults it has, and what organisation does not, the County Board has presided over a level of success that most counties in the country would envy. The players’ modus operandi has been simple: strike, issue ultimatums, refuse to speak and raise the temperature by carefully choreographed public events. No amount of these can disguise the fundamental truth, however. No dispute was ever resolved in the absence of dialogue. Even our critics have acknowledged that the Board and Gerald McCarthy were open to compromise and changes in direction for the sake of Cork hurling by taking on the Duffy/Cooney document. The players were not. Neither would they meet under Olan Kelleher or other offered auspices. All the calls for a resolution excluded any responsibility on the players’ part. My reasons for taking the stand I did four months ago are as valid today as they were then. Hurlers should not have the right to appoint their own manager, veto the appointment of a manager, interview their own manager or pursue commercial interests at the expense of the broader GAA family. From my perspective, they have dishonoured the Cork jersey and used it as a weapon and a threat. I believe that for the majority of previous Cork All-Ireland winners, and we did have some before the 08 Panel arrived on the scene, that is the ultimate sporting abuse.